You are here: Home / 2018 Congress / South Africa: "Let us look forward to the next five years. Let us never forget the struggle. Together We will overcome so much more!" I am so happy to be addressing you all today on this momentous occasion- the second Congress of the IDWF. I say it is momentous because what we have achieved together over the past 12 years is something we could only have dreamed of before we started on our journey towards the formation of our global federation. Why do I say this? Remember who we are. We are the children of so-called kitchen-girls and garden- boys, born into poverty, lacking good education and without opportunities to uplift ourselves and our families. But we found a way. Despite being told that domestic workers could not organize, we did it. We came together to organize and to fight for recognition and rights as workers like all other workers. As Dan Gallin our wise mentor and advisor, said at our Founding Congress “You have created a federation of workers who until recently were not even perceived as workers. You have demonstrated that there is no such thing as unorganizable workers”. I want to speak about our journey as domestic workers -from where we were to where we are now. Memories quickly fade away and it is important that we never forget our history and the lessons learned along the way. The year 2006 started as just another year. However that year was the start of so much. In November a conference was held in Amsterdam- the first global conference of domestic workers. It brought together domestic workers from many countries to meet and talk about their lives as domestic workers. How surprised we were to find that our problems and challenges were the same. How surprised we were to find that there were so many domestic workers’ organizations in so many countries. But although most organizations were small and struggling, they had determination and spirit! The conference was made possible because of the support from the NGO, IRENE and the FNV (Netherlands Trade Union Federation), and an international steering group. During those few days in Amsterdam many tears were shed for the hardship of domestic workers, the struggle to just be recognised as domestic workers. Many resolutions was made to plan the way forward, including working towards the formation of a global network and to fight for an ILO Convention for domestic workers. But, as is the case with many conference resolutions these remained on paper for a time. As far as our organizations on the ground were concerned there was silence for two years. But behind the scenes there was action. The IUF agreed to take responsibility for helping to develop the network and provide a home for it. WIEGO lent support and helped to raise funds. And in 2008 another meeting was called in Geneva, convened by the IUF. It was at this meeting that domestic workers from different regions insisted that the new network should be composed of unions and other democratic, membership-based organizations. NGOs could play a supportive role, but this was to be a network of and for domestic workers who would speak for themselves. An interim Steering Committee was formed to take things forward. Also at this meeting we heard for the first time that the ILO intended to put domestic workers on the agenda of the International Labour Conference (ILC) in 2010 and 2011. Some of us had no clue of who or what was the ILO. We asked “Why do they want to talk about us without us?” Right there we made a decision that there should be NOTHING ABOUT US WITHOUT US. This process was really a learning experience for all of us involved. All of a sudden we were exposed to a political world, a cruel world where we were not recognised. We are treated as slaves. We had to learn to understand this powerful international body and how it works. We had to understand the functions of this body which was now going to be in control of our lives. We had to decide what we want to do for the next two years. We had to shed our fear. We had to stop always feeling ashamed of ourselves. We had to stand up and speak out. WELL WE DID JUST THAT!! June 16th 2011 we gained our freedom, our dignity and respect. The world now had to accept us as workers and our work as decent work. Convention 189 belongs to us. It was a historical day in our life. The ILO had listened to the voices of the domestic workers. A song was born. Domestic workers got a Convention. We celebrated. We sang and danced. We unfurled a banner in the Assembly Hall at the ILO – something that no group had ever done! We were happy. So, yes we have a Convention but how will it reach those that cannot read or understand? Or those who are still treated like slaves- locked away in their employers’ homes without means of communication with other domestic workers? This is our challenge and one we are facing head on every day. 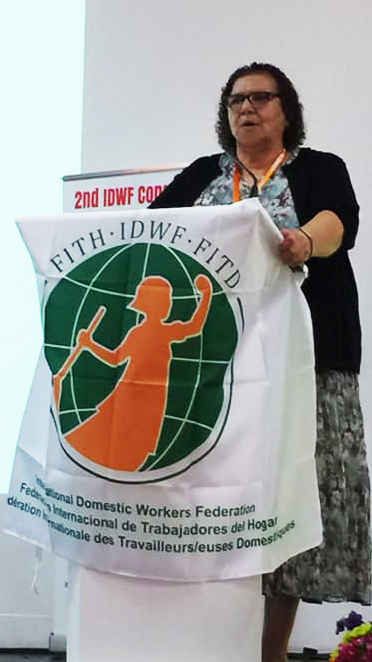 2013 saw the launch of the first ever International federation for domestic workers in the world- our International Domestic Workers Federation. We shook the foundations of countries, governments, employers and yes, even trade unions. Our message was strong. We broke our chains. From that day on our voices will be heard until we all are free and equal and justice has prevailed for all of us. What was the biggest victory of all? A workers’ federation spearheaded by women – women domestic workers. The first one ever in the history of our country. Since those three days in Montevideo, Uruguay we have had many ups and downs. There were many challenges to overcome. We started with just ideas, determination and goals. Today we are visible in 55 Countries with more than 600 000 domestic worker members. Yes there are still many that are unorganised but we will get there. Our goals and aims still remain to organize, mobilize and educate and to improve the lives of all domestic workers. Over the past five years we had to learn to deal with many different organizations- organizations with different views and even some that were not prepared to change and abide by our Constitution. We had to learn that all countries had their own way of organizing and some that want to remain in control and don’t want to accept changes. We had to learn and understand that the struggle differs from one country to another. We had to remain humble always listening and always trying to assist. We may not have been able to assist financially but we always try to highlight the struggles of domestic workers. We learnt how to campaign on social media and how to use it to support each other. I want to mention some particular challenges we face. Some of these we are already tackling in our plans and activities. Others will be discussed and resolutions taken on them over the next four days. In developing our Federation we need to pay particular attention to building a strong base that can hold the leaders accountable. Building strong and accountable leadership is not easy. We have done a lot over the past 5 years and I congratulate all our leaders for the work they have done- but we need to do more. We need to develop new layers of leadership that are committed and hold to our values and principles. There is always the danger of our leaders becoming distant from the members and forgetting to listen to their concerns, or failing to take up their mandates or to report back. This is especially a danger for an international organization where leaders have opportunities to travel, to learn new things but can forget they are serving the working class. We always need to remember who we are and where we come from and why are we here. We have to ensure that the newly elected Executive Committee will be there for the building of the Federation and not for self-gain or for the power, or just for the name or even for financial gain. We need to know that at times we need to make big sacrifices. This is a challenging role. Once we have committed ourselves, there is no turning back. This Federation is huge and the challenges remain. ORGANIZE, ORGANIZE AND ORGANIZE!!! A second major challenge is how to make sure we have resources and can sustain our Federation in a way that it remains democratic and independent– which means that our affiliates too must have the resources to sustain themselves and grow. We need to understand that the Federation may not have the answer to all financial problems but we can work together to support each other. This serious issue will be discussed in this Congress and I hope we can come up with a meaningful programme of action to take us forward. We have taken on the task of organizing migrant domestic workers. This is a hugely important part of our work but highly challenging. We have made great strides in the MENA countries where the treatment of migrant domestic workers remains inhuman. We must increase our efforts to organize migrant workers wherever we find them and educate our members to accept their sisters and to bring them into our unions and organizations. I hope this Congress will strengthen our determination and solidarity. THANK YOU FOR THE TRUST YOU HAVE IN ME. I THANK YOU FOR GIVING ME THE CHANCE TO LEAD, TOGETHER WITH THE EXECUTIVE, GENERAL SECRETARY, STAFF AND ALL. IT IS SUCH A UNIQUE ORGANIZATION. AND MAY WE ALWAYS REMEMBER THE FEDERATION IS BIGGER THEN ALL OF US THAT LEAD. YOU-THE WORKERS, THE MIGRANTS, THE URBAN, THE RURAL, THE CARE GIVERS- YOU ARE THE MOST IMPORTANT PERSONS. THIS FEDERATION IS OURS AND WE NEED TO BE PROUD OF IT. AND WE NEED TO PROTECT IT AT ALL TIMES. WE MUST BE LIKE A JEALOUS MOTHER PROTECTING HER CHILDREN. A HUGE THANK YOU TO MY OWN UNION SADSAWU FOR ALLOWING ME TO LEAD THIS FEDERATION. We have shown the world the power of domestic workers (inclusive of all domestic workers). We have proven that we remain united and can face all our challenges. Let us look forward to the next five years. May we remain humble, brave and strong. Let us never forget the struggle. YES -TOGETHER WE WILL OVERCOME SO MUCH MORE! Source: President Address by Myrtle Witbooi on November 16, first day of the 2nd IDWF Congress.